Warren Minor Christopher (October 27, 1925 – March 18, 2011) was an American lawyer, diplomat and politician. Christopher was born in Scranton, North Dakota on October 27, 1925. He was raised in Los Angeles, California. Christopher studied at the University of Southern California and at Stanford Law School. Christopher served as the 63rd Secretary of State under Bill Clinton's presidency. He also served as Deputy Attorney General in the Lyndon B. Johnson administration, and as Deputy Secretary of State in the Jimmy Carter administration. At the time of his death, he was a Senior Partner at O'Melveny & Myers in the firm's Century City, California, office. He also served as a professor in the College Honors Program at the University of California, Los Angeles. At the behest of Al Gore, Christopher oversaw the Vice President's Florida recount effort in the aftermath of the disputed United States presidential election, 2000. He married Joan Workman during the 1940s. They had two children. They soon filed for a divorce. Christopher soon remarried in 1956. They had two children. Their marriage would last until his death in 2011. Christopher lived in Los Angeles and in Century City, California. Christopher died at his home in Los Angeles, California on March 18, 2011, from complications of kidney and bladder cancer. He was 85 years old. ↑ 1.0 1.1 Robert D. Hershey Jr. (March 19, 2011). "Warren Christopher, Ex-Secretary of State, Dies at 85". The New York Times. ↑ Tripp, Leslie (2011-03-19). "Former Secretary of State Warren Christopher dies". CNN. Retrieved 2011-03-19. 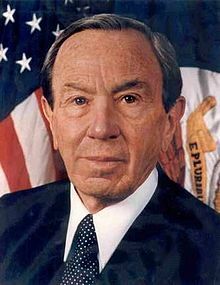 ↑ "Former US Secretary of State Warren Christopher dies". BBC. March 19, 2011. Retrieved March 19, 2011. This page was last changed on 20 June 2018, at 03:36.